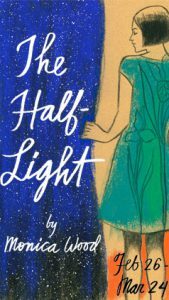 Portland Stage Co. will lead a discussion about their current play The Half-Light by Monica Wood. A chance encounter presents a tantalizing question for a college secretary: Can anyone be trained to see the dead? Her dogged pursuit of an answer leads to a far more earthbound challenge when a colleague is felled by grief. A heartwarming drama about love and purpose that examines the ghosts that live within us all. Affiliate Artist Monica Wood is the author of Papermaker, The One-in-a-Million Boy, and When We Were the Kennedys. Participants can enter their name to win a pair of tickets to the upcoming production at the beginning of the discussion, and a winner will be picked at the end of the discussion. Copies of this play will be available at the Research Desk, downstairs at the Main Library. Portland Public Library partners again this year with Portland Stage Co. to present Page to Stage discussions around the 2018-2019 season. These discussions, led by Portland Stage artistic staff, provide insight into the literary and social aspects of the play, as well as exploring the challenges of bringing a particular play to the stage. Participants can enter their name to win a pair of tickets to the upcoming production at the beginning of the discussion, and a winner will be picked at the end of the discussion. Page to Stage is held at the Portland Public Library at 12:00 noon on Tuesday two weeks before the show opens at Portland Stage. Copies of the play are available at the Portland Public Library’s reference desk for participants to read before the discussion if they would like to. Feel free to bring your lunch – coffee and tea are provided!